A new mold! 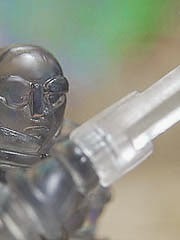 We don't get a ton of all-new molds, and it's worth noting that the Glyarmor Hades Trooper is actually just an add-on for the regular Pheyden figure. Well, it would be - but it's sold as a set. 12 new pieces were tooled up and assembled on the Pheyden body, meaning that if you use as many of the new parts as possible you'll still have 4 limbs and 2 heads left over unused. It's kind of a waste - there are lots of spare arms, legs, and heads as well as torsos out there, but nobody has a surplus of hands and feet to make other new figures from. Pre-orders are live now for the vinyl Titan Mushi! They range $33-$75, and 3 styles are up for sale as I write this on The GodBeast store. You may be just as - if not more - interested in this article at Onell Design which highlights the creative process with concept art and tons of fun anecdotes. Toy creator commentary is scarce, so check it out: Titanic Intentions. Enter the Glyarmor! If you wanted to end the year with a bang, this is it - a new Glyarmor not only has a cool helmeted head, but also a Chozo-like bird head. It also sold out really quick. Click here to see the December 15 2015 Onell Design drop menu. Click here to order what's still available - at press time, it appears 11 of the 20 items remain. Hey, a new drop! Onell Design has glow-in-the-dark stuff hitting Tuesday at 9:30 PM EST. But what? So far we've see a painted Crayboth - wow! - a Sarvos, Hades, and... we're not sure. But that's it so far. 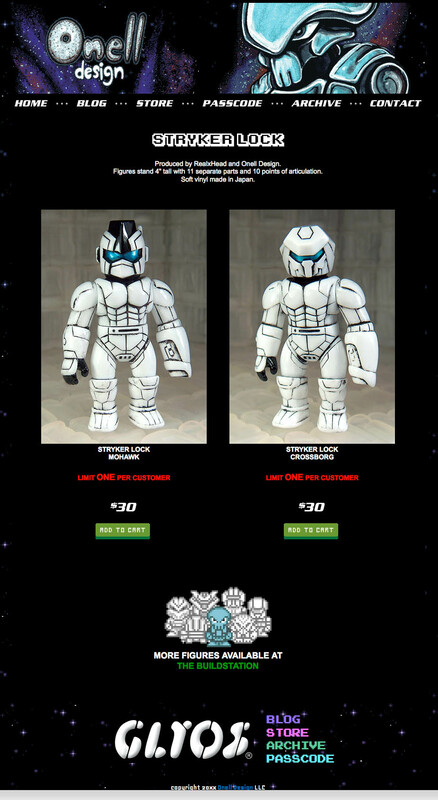 If you go to the Callgrim Shop right now, four Star Wars-inspired figures are up. Meet Bobaran, Eyegee, and Trando - plus a new Firespray Warp Bike! 25 Bobarans are left, so you should probably snag these sooner than later. Click here to see the shop. Hey, a new drop! A drop of 6 figures is set for 9:30 PM Eastern on Sunday, November 15. A new Noboto and a "Gruesome Gator"-inspired Granthan are on deck, and who knows what else? I'm excited. You should be too. Click here for the tease post. 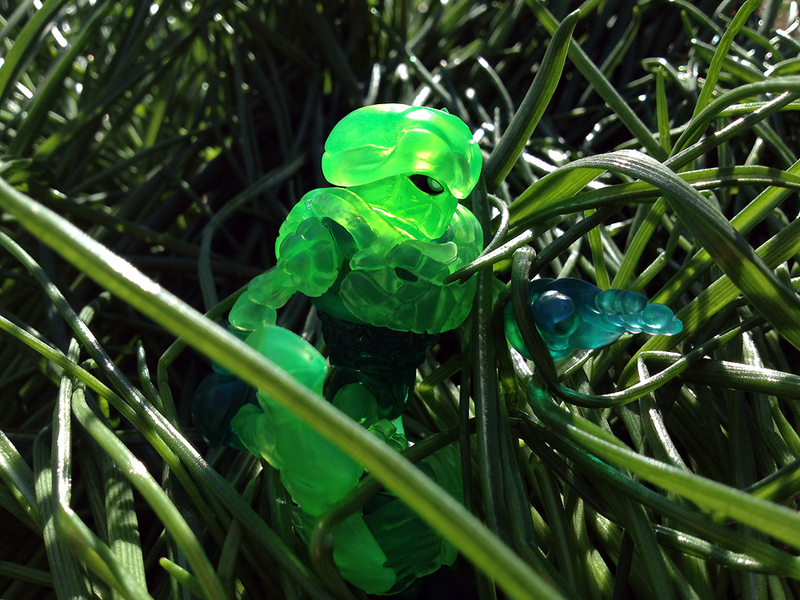 New Glyos! On Sunday, there will be another drop at Onell Design. 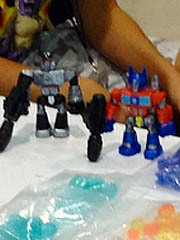 The new figures seen so far are metallic blue Argens and Robo Force bucks, but what else? We don't know - stay tuned for more, and be here at 9:30 PM on September 6 for more. 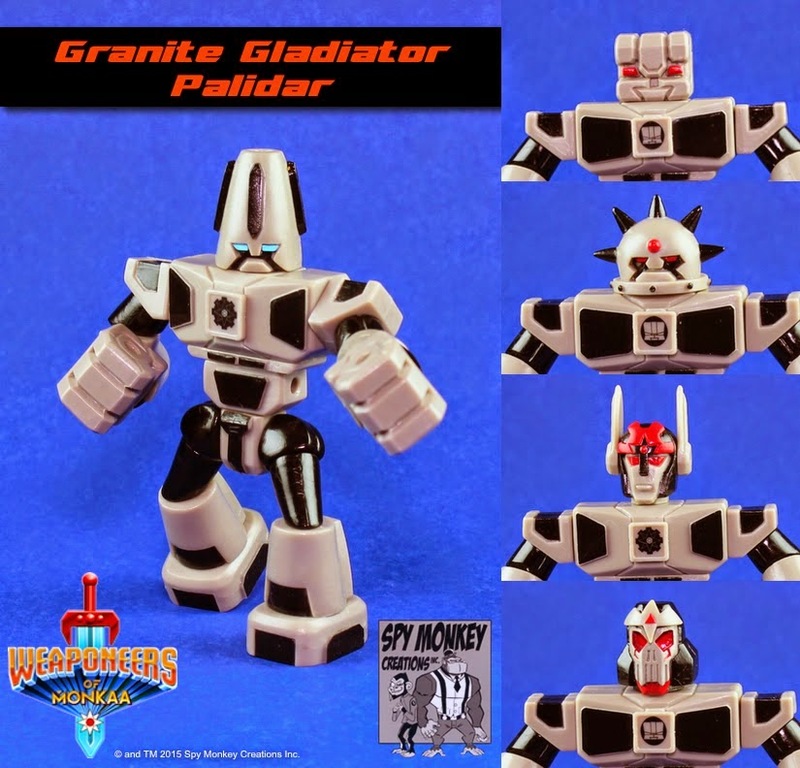 Onell Design has been great about making numerous recolors of its many toys, and seeing more than one flavor during a mold debut seems to benefit everybody. I snagged Skeleden Nemica Icewave along with the Standard version during the debut, as the blue struck me not unlike the many "holographic" figures from over the years. It's a neat figure, particularly early in its lifespan. There have been a few awesome bright clear figures since, and I assume there will be many more - I just happen to love the blue here. Skeleton Warriors Kickstarter: Kickstarter Next Week? The toymaking lovely people at October Toys posted a swell Grimskull Update. 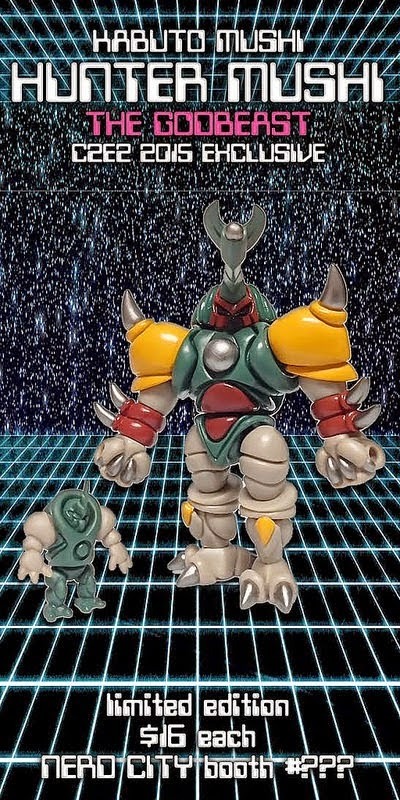 The Kickstarter for this Glyos-compatible figure goes up the first week of September, and based on what was previewed at Comic-Con it's looking good. It's also the 20th anniversary of the brand. If you remember reading about it in Tomart's Action Figure Digest too, that means that you are old and that this is the mummy's curse. So be sure to save some money, don't blow it all on Force Friday. There used to be a pretty steady stream of new versions of this mold, but the Argen MK XVII Electric Revenant continues the line nicely - and slowly. A ton of Buildman figures are out there, but in the last couple of years we've seen new heads introduced and now we're seeing more deluxe versions bundles with Axis Joints right off the bat. During the launch Onell Design also made matching Dark Teal Axis Joints sets alone, plus Swing Joints and Phase Arms. You've got plenty of room to upgrade this figure, and the set has enough extra pieces to keep it interesting as a $12 packet. In the world of collectible toys, momentum and an engaged fanbase are valuable assets. Power Lords debuted to much fanfare and tremendous goodwill, and then had neither. Ggrabbtargg was a good example of how the Horsemen put together a good idea on a good license, but through the magic of time and waiting people may have just moved on. The item sold quickly thanks to its low production run, but the low going rate on eBay says it all - people don't have a lot of hope for this line which, after nearly two years, has yielded exactly two figures (with some repaints and remolded parts). Expectations were high, as the Horsemen delivered a pretty rapid clip of Outer Space Men to the tune of four per year for the first two years. Even a high-quality trickle of repaints is still a trickle of repaints, while the loyalists wait to see what (if anything) happens with this once and possibly future Glyos-compatible line some of us just kind of shrugged and went back to our consistent favorites. 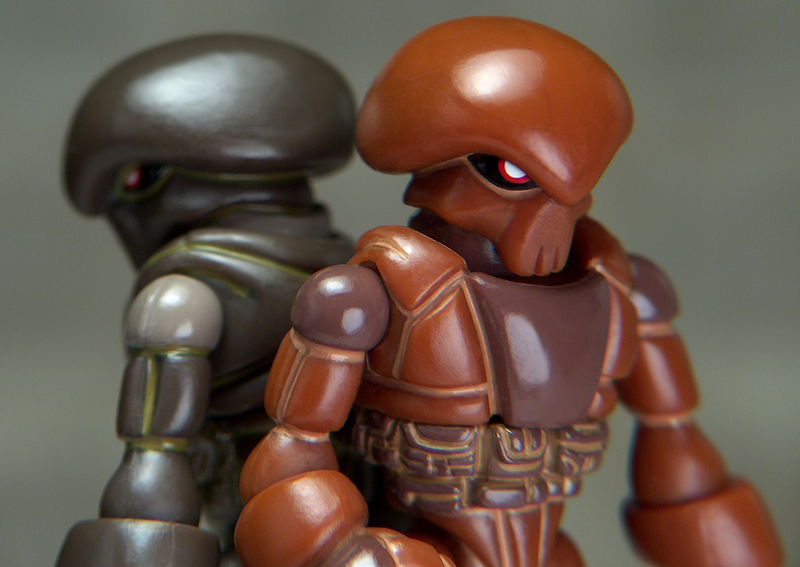 New from Spy Monkey Creations: Villhaintron and Optimum Gearo! $20 each, 8/21, Friday at 12:00 PM Pacific time. Each deluxe figure gets 45 parts with multiple weapons and heads, and the Megatron-like robot is pretty fantastic. Check 'em out! One of the problems I've had with toys is, at times, especially in indie spheres, things can take an aggressive turn toward "I've got that." Quality, value, and niftiness can only take you so far after a few years of collecting a line of new colorways, even if there are some really neat ones like the Skeleden Ullcroth Mutation. 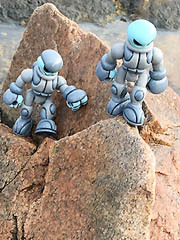 The real genius in the Onell Design Glyos figure is how, at times, they can take a figure you've bought and sell you another one with a wholly new perspective, at no extra cost. 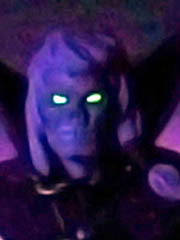 Glow-in-the-dark figures absorb much of the sculpted detail, leaving you to focus on the action feature and its general form. Clear figures give you a look at the guts. But one of the more interesting features - the panel lines - were phased out due to costs. And now, we had them brought back for a special pair of Skeledens, where the savings of the rising middle class in China are also being passed along to you. This one was $18 - panel line-free versions were about $12. The added paint lines are applied with an eye toward perfection, but it also raised the cost by 50%. Seeing where you'll spend money is another great way to gain perspective. Transformers Weaponeers of Monkaa Coming? A sneak peek - or a custom? The Weaponeers of Monkaa showed off a couple of Transformers-inspired pieces at Kansas City Comic Con over the weekend. Is there more to this? Probably! We'll post more when we find it. Click here to see it on Instagram. The NiStuff Store has been updated with Betaforce 6 figures! Leydens, Outlanders, ancient astronauts, and some other stuff are up for grabs. Click here to see what's left. 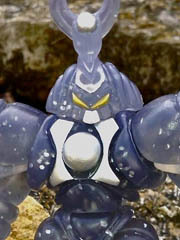 Five new flavors of Kabuto Mushi figures will be available at 8:00 PM Central on August 14, 2015. You can read about them on the October Toys forums! Infection Cyborg (Glitter w/ more Ultra Gold paint) $16 ea. 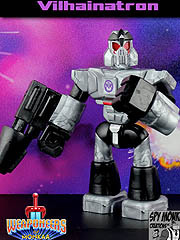 Shadow Cyborg (Glitter w/ more Ultra Silver paint) $16 ea. 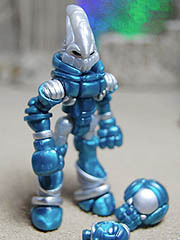 BlueStar TigerForce (currently unreleased in the Glyoverse, metallic colorway) $12 ea. Iron TigerForce (Gun Metal matching Glyos w/ red paint) $12 ea. 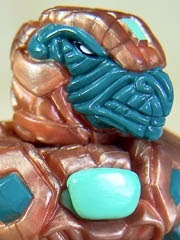 Amazon TigerForce (Metallic Teal Blue w/ orange paint) $12 ea. The Black Bridge of Glyosar! Loads of D&D-inspired figures, an Argen that looks like an X-Ray Man, and oh so many panel lines await you. Click here to see the July 21 2015 Onell Design drop menu. Click here to order what's still available - at press time, it appears to be everything. Fantastic? Spectacular. These figures bring back panel lines and look pretty stunning, which is unfortunate if you've been trying to cut back on your indie toy purchases. Click here to see the menu, or read below the break to see it pasted below. But seriously, go there to see the pictures. Details are thin, but park your fanny online on Tuesday. At 9:30 PM Eastern, a new drop is going up at Onell Design to celebrate their 8th anniversary of making (and facilitating) great indie toys. At this time I have no specifics, but they are promised soon in this blog post. Note - panel lines! "Through the Citadel" should be a fun time and I hope some new games or comics come along for the ride. Over at TheOuterSpaceMen.com, there's a sale now - figures dating back several years are up for grabs, individually, for as little as $10. Even the Cosmic Creator figures that some of us spent $125 on for the set and carried them back to our hotel in New York a couple of miles in the snow are down to a paltry $20 a pop - a fantastic price. It looks like a few may have sold out, but $10 Cosmic Creators and $15 Cyclops Infinity are some pretty fantastic buys. Get 'em while you can! If you're going to San Diego Comic-Con, you'll want to stop by the October Toys Booth. 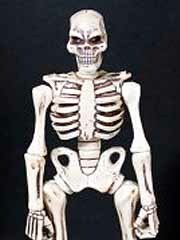 #4951 has a weathered Titan Skeleton (pictured) as well as a metal Deadbeet, OMFG series 1-4, and some other goodies. 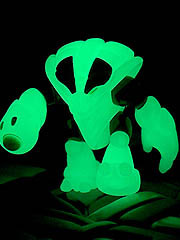 I'm a sucker for glow-in-the-dark toys. When I saw the Kickstarter for Skeleton Warriors included a Glow-in-the-Dark Titan Skeleton, I needed to buy this 5-inch super-articulated figure. Usually I snag the Kickstarter-exclusive versions - which in this case was clear blue - but I went for glow and bone and am glad I did! In case you missed it: June 26, 2014 TheGodBeast Menu. Four new figures, a couple of paint test figures, and some still-available classics. Of note, the new Zilla Mushi and Zing Mushi figures. Click here to order - they're still in stock! Hey, there's a drop on Friday! 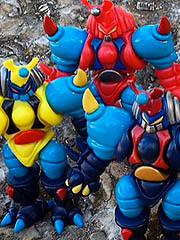 TheGodBeast's Instagram Feed has shots of Shogun Warriors-inspired Kabuto Mushi. If you like Mazinger or Godzilla, you'll probably see something you like. Return of the Manglors - plus so many robots! Loads of silver Gobons, Buildmen, Noboto, and so many others join a suite of purple and green. It's a nice batch. Click here to see the June 14 2015 Onell Design drop menu. Something new! 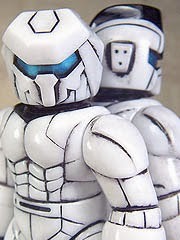 For $20, you can get the Nemo's Factory Glyos A/V Robot First Release right now - while supplies last. It's orange, it's $20, and it has a cool head. 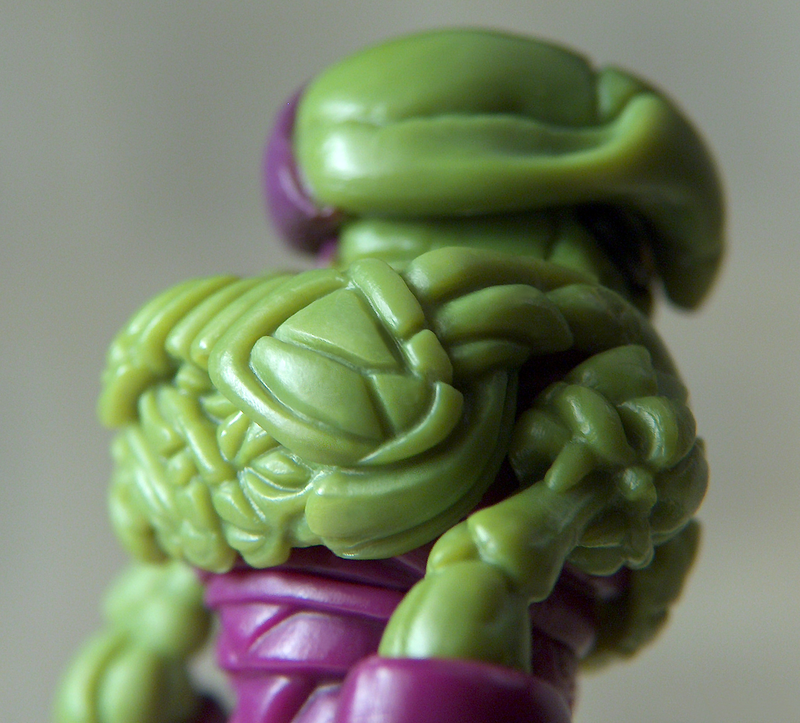 The details are unknown beyond this: Sunday, 9:30 PM Eastern, Manglors-inspired Glyos drop at Onell Design. We see a Skeleden, but new molds (like Manglors) are an unknown. Click here for the announcement. Star Warsy! There were no blog posts or news listings for this one - if you weren't watching the forums or social media, you'd have missed it. Click here to see the June 2 2015 Callgrim drop menu. 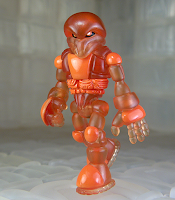 Having been following Glyos lightly since shortly after its inception and paying close-ish attention since 2010, I know RealxHead products don't come up much. Mori is a guy who makes low-run, hand-painted and assembled vinyl figures in tiny batches sold mostly through actual physical stores. This means you most likely aren't going to get them. The runs he does are small, and based on the numbers I saw in the carts on launch day Stryker Lock Mohawk sold through in under two minutes. You could still add units to your cart for somewhere under 120 seconds, and that's it - when I checked inventory it was down to double digits quite quickly, which prompted an announcement for a possible fourth run. (This would be the second US shot at the figures.) These products come and go quickly, and their hand-made low-run nature inspires the awed, hushed tones that make them something of the toy equivalent of cryptozoology. If you aren't at C2E2 - and you probably aren't TheGodBeast posted an update with new figures from the show, right now. Get them while you can! Each new figure is $16 and is already marked "low stock," so get yours if you dare. 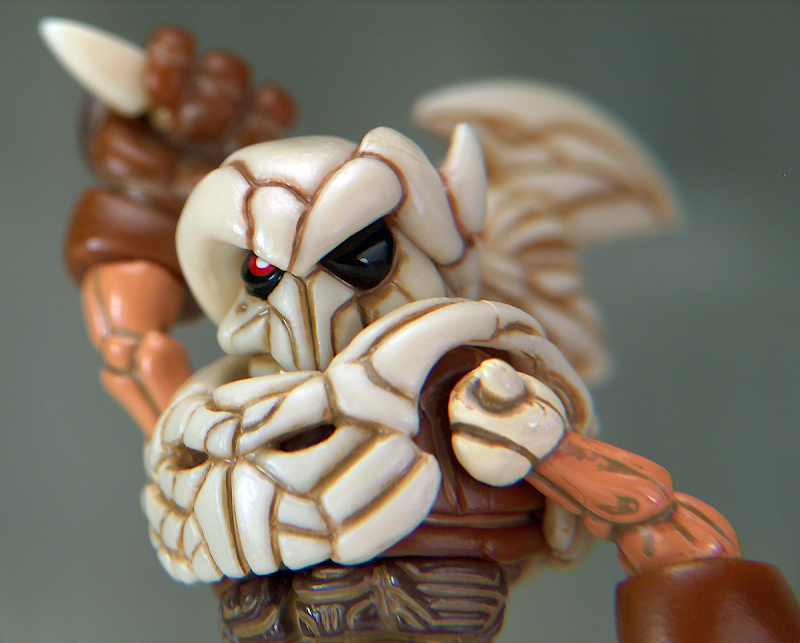 If you missed out on the Kickstarter, the 5-inch Glyos-compatible super-articulated Skeleton Warriors are up for grabs at October Toys now. Baron Dark (left) is boxed and $20. Unpainted Titan Skeleton and Glow Titan Skeleton are each $10. They're really good, especially the $10 ones - I'm working on a review right now, so get yours and play along at home. Return of RealxHead! I got my order in for a figure, and it was still possible to add these to a cart for about 2 minutes after they first popped up. Click here to see the May 15 2015 Onell Design drop menu. As far as I can tell, the drop seems to be somewhere in the lower double digits. This post outlines that a second run is likely - and that this was the biggest run ever. And it still sold out in 2 minutes. Wow! If you're going to C2E2, you've got ample reason to hit up the Nerd City booth (number unknown) once again. 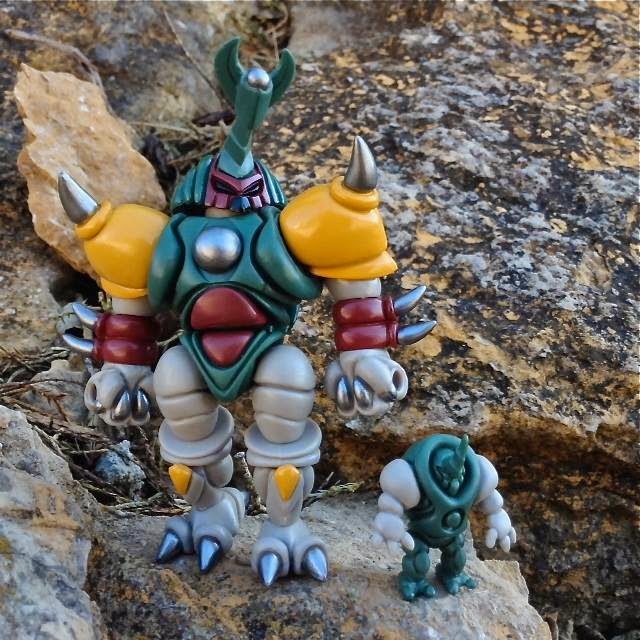 Marty "The Godbeast" Hansen once again has a pretty healthy Glyos offering with Kabuto Mushi figures based on a variety of inspirations, all of which can be seen here. 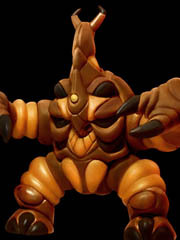 There are four figures in all including the Boba Fett-themed Hunter Mushi, the Skeletor-themed Overlord Mushi, and even a winged Hornet Mushi to name a few. Figures range $16 to $25. Six new and returning items will go on sale Friday at 12:00 PM Pacific time. This page has details of the drop, with 3 new figures at $12-$15, a new $3 weapon pack, and 2 returning figures at $20 each. If you like He-Man, it's probably worth a look! Check it out! 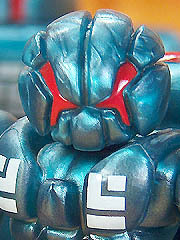 For years I've been following Glyos and reading about RealXHead, but never was able to get one. On Wednesday, this changes. Click here to see what $30 can get you Wednesday at 9:30 PM Eastern. 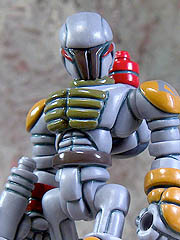 Stryker Mohawk and Stryker Crossborg are each 11 pieces of soft Japanese vinyl, merged to a 4-inch action figure. If you want one, this is one you may actually be able to get for a change. Starting Saturday, you can get some new parts! The 481 Universe expands according to this post: "New clear accessories are approaching fast!" What accessories and which colors remain to be seen, but heads, helmets, and weapons are promised in an $8 packet. Sounds fun! Return of Skeleden - plus Noboto, Gobon, and More! The big special this time was an exclusive recolor of the Robo Force mode, and it's gorgeous - I regret that I did not get an order in for this one. There are a few items left as I type this, with 8 items remaining of the initial 21 offerings. Click here to see the March 31 2015 Onell Design drop menu. Surprise! I missed the memo and new Mission Details are up on Onell Design. The new drop hits Tuesday night with a new Neo Granthan, Noboto, Gobon, Skeleden, and a Gendrone Force Defender - which is Maxx Zero bits reconfigured for you here, and for $16. Click here for more on The Sendollest Drifts drop.